It is a thin walled flexible tube. Its lumen is kept permanently patent by means of ‘C’ shaped hyaline cartilages. The trachea is lined by pseudostratifled ciliated columnar epithelium with interspersed goblet cells resting on a basement membrane. The lamina propria consists of elastic fibers, lymphocytes both segregated and aggregated and, short due to: the glands. These ducts open on the free surface of the epithelium. The deeper part of lamina propria is the submucosa which contains both mucous and serous acini that keep the epithelium moist. The mucus provided by mucous acini entangle the dust particles. Cilia move the mucus towards larynx. Coughing also moves the mucus towards larynx to be expelled from the respiratory system. 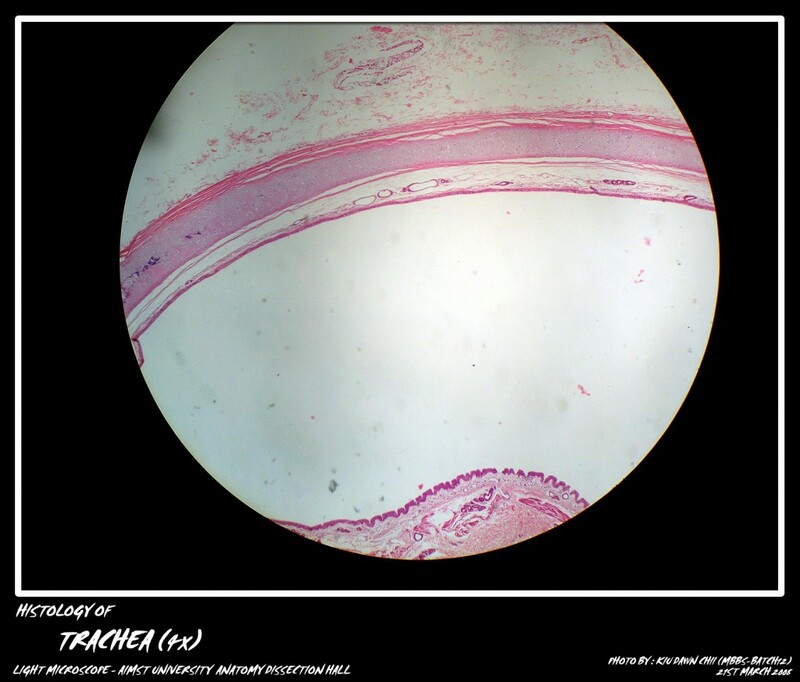 The most characteristic feature of trachea is its supporting framework of 16-20 ‘C’ shaped hyaline cartilages that encircle it on its ventral and lateral aspects. The posterior wall of the trachea adjacent to the oesophagus is devoid of cartilage. Its place is taken by transverse smooth muscle fibers, the tracheal is muscle. The cartilage is covered by perichondrium on all sides which separates it from the neighbouring structures. The outermost layer is the adventitia which contains blood vessels and nerves.